The Internet was already making its presence known to media in 2001, even if it was still not on the minds of most. Print and television were still raking in outrageous profits despite signs of trouble, and after all, AOL Instant Messenger was as advanced as most people got back then. High-speed Internet was gaining ground, but not ubiquitous, much less on cell phones. The smartphone, widespread wireless Internet access and high-quality live online video were nonexistent. The iPod was more than a month away from being introduced. Twitter, Facebook and any social network/portal you can think of that’s still relevant (sorry, Yahoo! and Myspace) were years from conception. Thus, on 9/11, television was the primary way of getting news, and people eagerly grabbed the next day’s paper (even overseas) to see how the news was played (or, perhaps, to see “bastards” allowed onto on the front page). The Internet was part of the coverage, but with fewer resources, fewer updates and a presentation that can look positively ancient today. But one pattern that emerges was a hopeful one, oft-forgotten — when you have big news, don’t be afraid to clear away the dregs. Mashable today published a great look at what online media looked like on 9/11. Notice that the Drudge Report has essentially never changed. I’d like to examine a few of the biggest players for what they look like then — and now. New York Times — Then, a free site. Today, a confusingly permeable paywall. Sept. 11, 2001 — The Times did have some interactivity and structure here, with stories from different perspectives and cities, multimedia showing what had happened, how it happened and even the video of the second plane hitting the towers. Further, in a public service move not usually associated with the Times, there are lists of emergency resources. Sept. 11, 2011 — The modern N.Y. Times, with ads, a Sunday focus on the right-hand side, about 15-20 more links on the left-hand side than necessary, but with a strong central component that probably wasn’t possible in the dial-up era of 2001: A slideshow on the front page. Also, the page itself is significantly wider, a nod to modern monitors that were only beginning to see wide adoption back then. 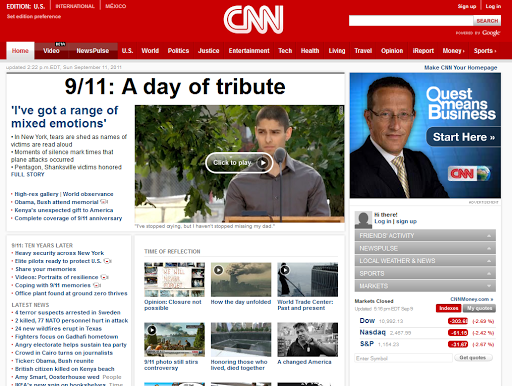 CNN.com — A TV network that couldn’t offer much video on 9/11. Now, there’s almost nothing but. 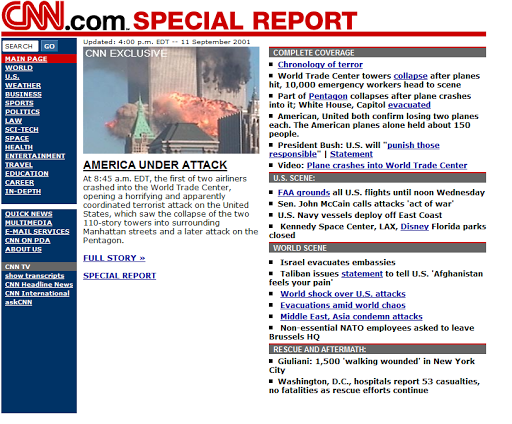 Sept. 11, 2001 — Again, a website that clears all other now-irrelevant news from its homepage to showcase what’s going on. A surprisingly modern use of in-line hyperlinks and absurdly long left-hand links list. Also, note a lack of slideshows or videos on the home page. Sept. 11, 2011 — In today’s area, we see a different, sleeker layout, advertisements and videos galore. Also, perhaps too many links, but at least the useless “sections” are at the top and easily ignored without taking up valuable space. The Onion — Terrible Web presence then. Today, the epitome of how to run a (fake) online news organization. The A.V. Club’s interview was with Joss Whedon, though, so not everything changes. 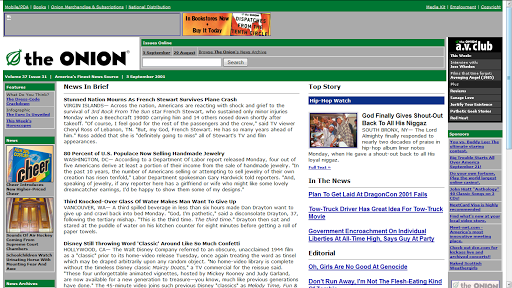 Sept. 11, 2001 — Back then, The Onion website didn’t update much, if at all, unless there was a new print issue out. The Onion printed on Wednesdays, then. Thus, it was the newspaper’s fate, just having moved its offices to New York City, to have a six-day-old story mocking a nonfatal plane crash leading its website on 9/11. 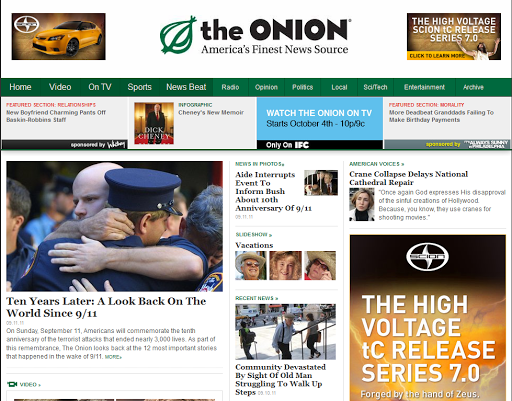 Sept. 11, 2011 — Much like the “real” media, The Onion has added video, advertisements and a more thoughtful layout. For a satire effort, its efforts to embrace new media are no joke. Really interesting post. I didn't even believe the 2001 NYT page was real at first. 10 years doesn't seem all that long, until you see a comparison like this. 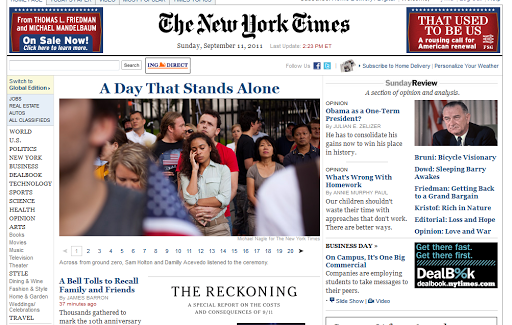 I feel like I must have looked at the N.Y. Times that day (or within that week), but I didn't remember it at all. The CNN page looked more familiar, for some reason.